This is a rather sprawling project in one of Montana's most historic and best preserved ghost towns. 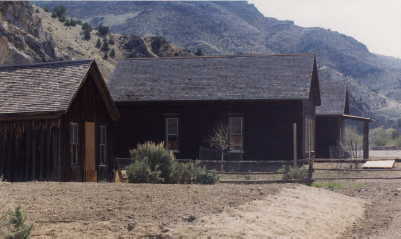 Bannack was the territorial capitol, following a major gold strike in 1862. Over a hundred buildings from that era remain today. My job involved inserting three new buildings into that setting as well as delivering an interpretive plan for the site, a site-wide fire detection and alarm system, structural assessment of 30 of the most endangered historic structures, and extensive indigenous landscaping. Context was the critical issue in the design of all three buildings. Though sites were considered which were away from the historic district proper and screened by topography and vegetation, the Park's programmatic and staffing requirements ruled out those easier to deal with sites. The Manager's residence required reusing and adding onto an existing 400 s.f. log shell to provide a home with atotal finished square footage of around 1,700 s.f. This volume of space had to be designed to fit into a grouping of three existing residential structures, all of them only a quarter to one-third the size of the proposed residence. The Park's shop building, though entirely new, faced the same critical issue--how to make a building that's over three times the size and only 50 feet away from the adjacent historic structures fit into the picture without overwhelming the scene. In addition to what was actually built, provision also had to me made to allow for future expansion which could ultimately double the size of the shop. It also had to screen vehicles and equipment used by park maintenance staff from view by those enjoying the Park proper. The iconic lobby of the Meade Hotel was gradually being destroyed by vandals. Graffiti crowded the walls and took the sense of history away from the visitor. The damaged finishes were repaired utilizing authentic materials and perserving as much of the original plaster as possible. Colored finishes were replicated in lime paint, exactly matching the original textures. 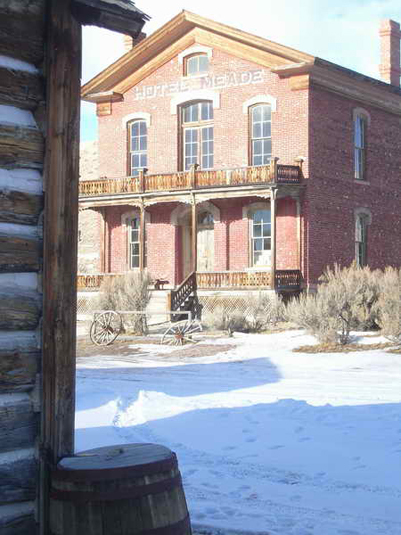 The Meade Hotel is the very image of the old west and the focal point of Bannack--Montana's first territorial capitol. But many repairs were only half finished. 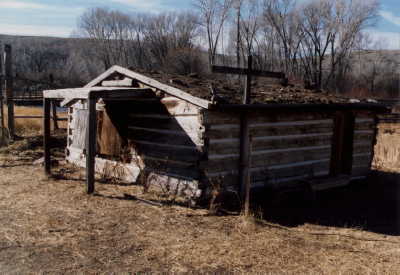 Wood foundations were failing and metal exteriors rusting away. The Meade Hotel completed, and the changes are like on of those puzzles where you try to identify what's different. But exterior finishes have been repaired or replaced. The building has been underpinned and floors leveled. Drainage, above grade and below, was installed. The Meade Hotel, with a little luck, will remain a Montana icon for another 130 years. 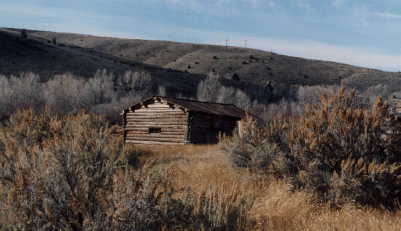 Left is the Bannack shop as a park visitor might see it if they were to walk all the way to the park boundary at the rail fence. The building in the foreground is close to 120 years old. The shop from this perspective appears to be two smaller-scaled, individual buildings, which could have served different purposes in the past, rather than a thoroughly contemporary shop with radiant heating, ventilation and exhaust facilities, public restrooms, garage bays, etc. 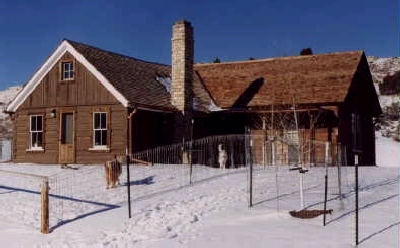 This photo shows the manager's residence, nearly complete except for some minor finish painting. 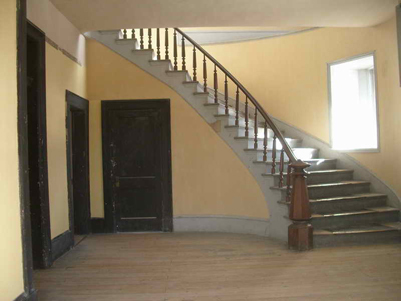 The project in Bannack also involved stabilization of several buildings. Left, a horse barn, was nearly a complete ruin before restoration. This final photo picture shows the "Governor's Mansion", with material that dates back to 1863. All these photos were taken within days of the work being completed, but site disruption was minimized through careful specifications and a cooperative and sympathetic contractor.